You are out in the dark, alone. You become aware of a distant rhythmical clicking noise. Sensing danger, you change direction and head for cover. Seconds later you are punched by wave after wave of sound that hits your body like a machine gun. The noise bears down on you, loud as an aircraft, faster and faster, blurring into a roar…. …You are a moth, taken by an echolocating bat. Bats aren’t blind. Their eyes work, but they live in a different world, requiring an extra sense. 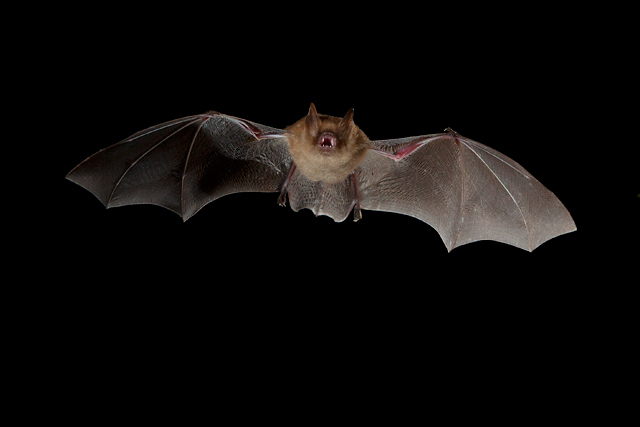 Using high frequency sounds, also known as ‘biosonar’ or ‘echolocation’, they can see in the dark. We see, hear touch, smell and taste by picking up cues in our environment. Biosonar is completely different; there can be no signal without the call. This really is seeing in sound. 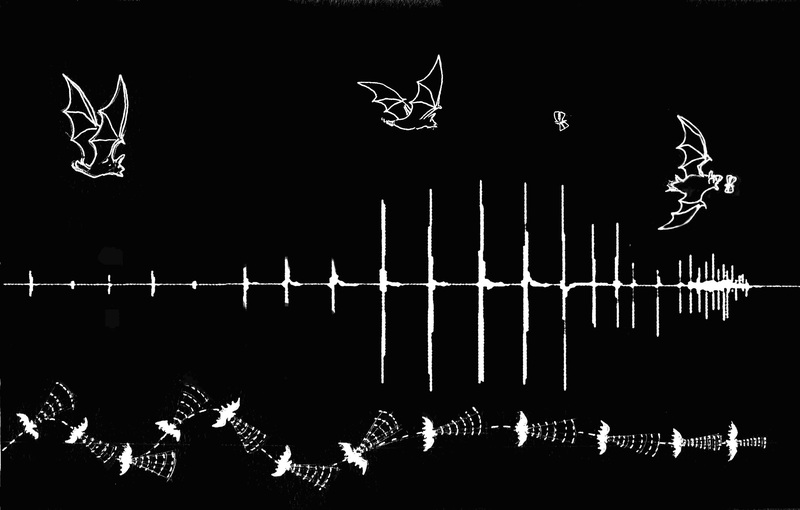 Biosonar provides bats and some other animals, including dolphins, with a distinctive and sophisticated form of vision, giving detailed three-dimensional information over long distances in darkness or murky waters. Most bats hunt using a range of frequencies, moving their heads to pulse sounds in different directions as they fly. Lower frequencies produce wider sound cones like a floodlight, and higher frequencies focus the beam like a spotlight. Although one lives in the forest and the other in the ocean, the way bats and dolphins use biosonar when hunting is almost identical. 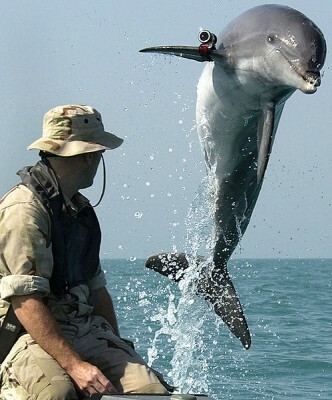 Dolphins, like bats, both shift the frequency of their clicks as they scan and lock onto prey, giving a characteristic ‘buzz’ of rapid calls as they take the target. Sound travels more quickly under water, so dolphin sonar operates over a longer range. Watch someone’s eyes as they examine something; their gaze jerks from one area to another. These are known as ‘saccade and fixate’ movements. They focus different parts of the image onto an area at the back of the eye called the fovea, which sees detail. ‘Saccade and fixate’ eye patterns are found in all animals with good vision, and is a defining characteristic for how eyes focus on details. 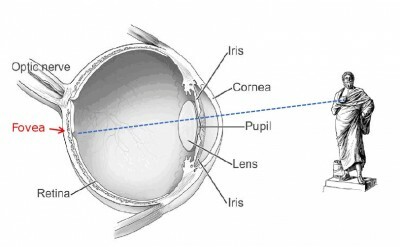 When our eyes focus, they project an image onto an area at the back of our eyes known as the ‘fovea’. This zone is specialised to pick up high levels of detail. Any sense can be developed to pick up a high level of detail; we use sight, bats use sound, and star-nosed moles use touch. Most bats hunt insects in the open air, listening for the returning echoes before making their next signal. They use a combination of head movements and focussed sound cones to gain information in a classic ‘saccade and fixate’ pattern. Wider head scanning and lower frequency calls provide a ‘wide angle’ view with less detail. Higher frequency calls and a narrow range of head movements create an ‘acoustic fovea’; this focuses their sonic gaze onto a small area and recovers detail, much like ‘zooming in’ using a macro lens. Horseshoe bats use echolocation in a different way; an adaptation to hunting in and around the spatially variable (and hence acoustically complicated) ‘surface’ of tree and shrub canopies. They use mostly constant-frequency pulses, and listen for Doppler-shifted returning echoes. The cochlear membranes of their inner ears respond over a broad frequency range, but have particular sensitivity within a very narrow bandwidth (their acoustic fovea). When locking the sound pulse onto their prey, they alter their emitted call in order to keep the frequency of the returning echoes constant. This allows them to focus on the frequency modulations caused by the fluttering movements of large insects. Just as the brain uses the different view from our two eyes to build a stereo image, our brains use the differences between what is heard by our ears to understand something of the direction and distance of a sound source. Bats use this difference to understand and construct a ‘stereo image’ of their surroundings in three dimensions. This enables them to understand something of the shapes and textures of objects in their environment. Some tropical bats are nectar feeders. Flowers hidden amongst the leaves are in an acoustically cluttered environment. Many flowering plants using bats to assist with their pollination have evolved floral structures that act as ‘sound beacons’. These are usually dish-shaped (parabolic) and bounce back an unique echo pattern that makes them become acoustically visible. 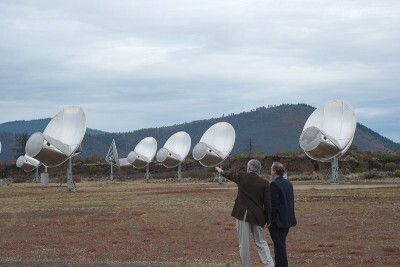 Parabolic shapes also make excellent receivers. The Search for Extra-Terrestrial Intelligence (SETI) project’s radio telescope is made of many parabolic ‘ears’, listening for radio transmissions from outer space. Whilst we have invented technologies enabling us to hear bat calls and signals from beyond our planet, our own ears’ convoluted parabolic shape also captures sounds, and funnels them to our receiver; the ‘ear drum’ . Fenton, M.B. (2013)  Questions, ideas and tools; lessons from bat echolocation. Animal Behaviour 85, 869-879. Connor, W.E. and Corcoran, A. J. 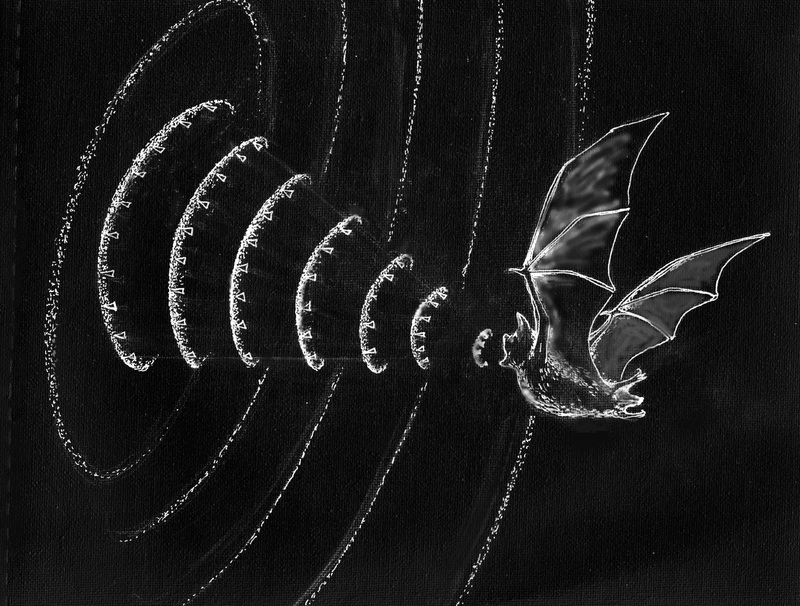 (2012)  Sound strategies; the 65 million year old battle between bats and insects. Annual Review of Entomology 57, 21-39. Ghose, K. et al. (2006)  Echolocating bats use a nearly time-optimal strategy to intercept prey. PLoS Biology 4, 865-873. Jakobsen, L. et al. (2013)  Convergent acoustic field of view in echolocating bats. Nature 493, 93-96. Land, M.F. (2011)  Oculomotor behaviour in vertebrates and invertebrates In  The Oxford Handbook of Eye Movements(S.P.Liversedge, I.D. Gilchrist and S. Everling, eds), pp. 3-15. Oxford University Press. Schnitzler, H-U. and Denzinger, A. 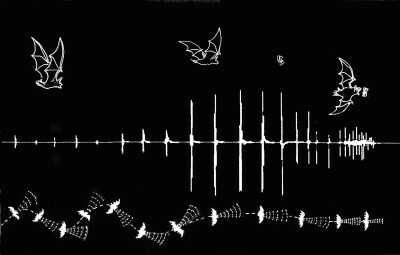 (2011)  Auditory fovea and doppler shift compensation: adaptations for flutter detection in echolocating bats using CF-FM signals. Journal of Comparative Physiology, A 197, 541-559. Surlykke, A. et al. (2009)  Echolocating bats emit a highly directional sonar sound beam in the field. Proceedings of the Royal Society of London, B 276, 853-860.
von Helversen, D. and von Helversen, O. (2003)  Object recognition by echolocation; a nectar feeding bat exploiting the flowers of a rainforest vine. Journal of Comparative Physiology, A 189, 327-336.
von Helversen, D. and von Helversen, O. (1999)  Acoustic guide in bat pollinated flower. Nature 398, 759-760. 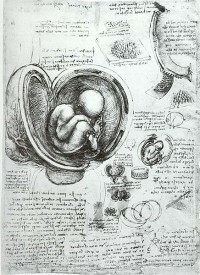 Our minds construct an internal version of the view before us, using a scant set of samples. We then modify this picture with what we expect to see. How does this skewed visual perception allow us to ‘make sense’ of our world?